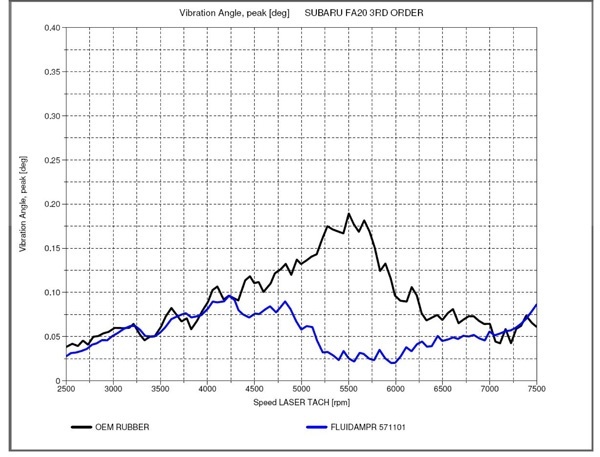 Part 8 - Crankshaft Torsional Vibration Test Results Continued. Vibratech TVD’s goal throughout this case study is to make a Fluidampr® performance viscous damper upgrade for the 2.0L opposed-four Subaru FA20 / Toyota 4U-GSE engine. In Part 2: Crankshaft Damper Design Criteria, it was discussed that the damper needs to provide optimum damping across a broad frequency range to meet the challenging demands of the performance racing industry. 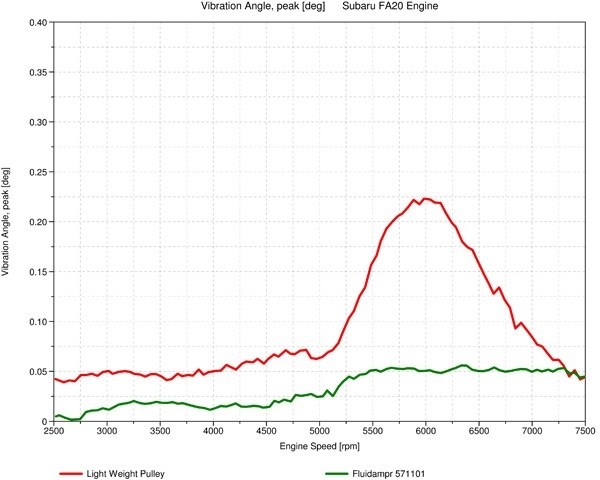 The overall torsional vibration analysis waterfall maps taken from our 2013 Scion FR-S, with a baseline dynamometer test at only 141lb-ft torque / 149 rwhp, revealed an initial close comparison between the stock tuned elastomer damper and the Fluidampr unit as expected. To gain a clearer understanding between the differences even at this relatively low power output, let’s take a closer look at vibration orders 2 and 3. The dominant 2nd order is the firing order in a 4 cylinder, 4 stroke engine. From 2500rpm to 5750rpm the Fluidampr performance damper clearly reduced torsional vibration magnitude by as much as 83%. Through that rpm range vibration spikes were also smoother and of lower magnitude. 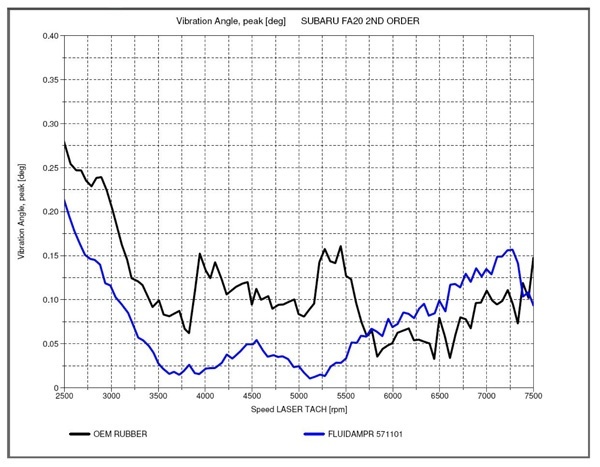 Approaching redline we again see a sharp reduction in vibration as the stock tuned elastomer damper continues to climb. A resonance point within the rpm range occured near 260hz with the stock damper installed and near 240hrz with the Fluidampr performance damper. The 2nd order vibration, induced by combustion and falling within the resonance point, excited a 3rd order vibration. The largest improvement was seen at the reduction of the 5500rpm peak where the Fluidampr unit was able to cut the vibration amplitude in half, down to below 0.05 degrees peak. Our final comparison is between the lightweight crank pulley and the Fluidampr performance viscous damper. As noted previously, the 1.195lb lightweight pulley shifted a 3rd resonance point at 600hz. Without any damping mechanism to control the torsional vibration spike the lightweight crank pulley allowed a large 6th order peak right at 6000rpm. Higher frequency vibrations can create hazardous stress, excessive wear and potential failure of bearings and oil pump gears. The Fluidampr unit reduced the 6th order to 0.05 degrees peak or less. How do these broad range improvements in reducing crankshaft torsional vibration across multiple orders relate to overall horsepower gains? Download the complete case study below to review the dyno results.